Methods for Postgraduates brings together guidance for postgraduate students on how to organise, plan and do research from an interdisciplinary perspective. In this new edition, the already wide-ranging coverage is enhanced by the addition of new chapters on social media, evaluating the research process, Kansei engineering and medical research reporting. The extensive updates also provide the latest guidance on issues relevant to postgraduates in all subject areas, from writing a proposal and securing research funds, to data analysis and the presentation of research, through to intellectual property protection and career opportunities. Clear and concise advice from distinguished international researchers on how to plan, organise and conduct research. New chapters explore social media in research, evaluate the research process, Kansei engineering and discuss the reporting of medical research. Check lists and diagrams throughout. 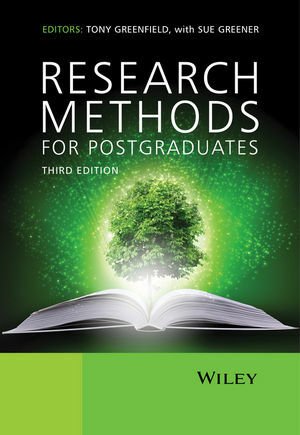 Like its predecessors, the third edition of Research Methods for Postgraduates is accessible and comprehensive, and is a must-read for any postgraduate student.